Karachi (June 15, 2017 Thursday): The directorate of National savings of Pakistan will conduct a balloting (voting) of worth Rs 200 Prize bond on 15th June 2017 (Thursday) this week at the office of Qaumi Bachat Office Karachi. 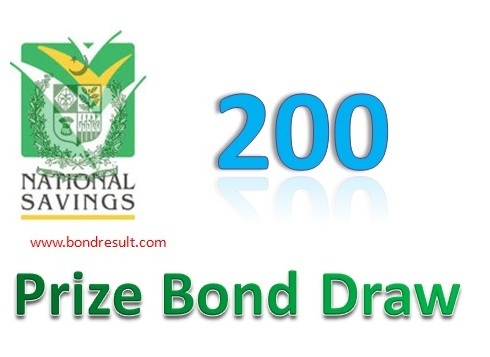 This will be the 70th Draw of Prize bond 200 till the draw. The complete prize bond 200 list result of lucky draw date 15th June 2017 (15.6.2017) will be uploaded at this page. You can download Rs. 200 prize bond list result of draw 15st June 2017 Karachi city on this page. The first second prize winners number will be updated at 9:00 am and complete list of Rs. 200 Prize bond list June 2017 will be updated at 5:00 pm by savings.gov.pk. We on Bondresult will update the full list on this page you are views. So bookmark it to save time and get your first life changing number from this 200 prize bond denomination. This is the old and lowest prize bond denomination by National savings in this history. This bond is socially bought in billions of quantity by the low salary and average income public. The reason behind is that the full copy of Rs. 200 Prize bond is bought in only 20000 thousand rupee and you have about 80 percent chance to win a single or more prize bond in a year. Mostly third prize is must but if you gone directly to first or the second one then you can get the life change. If you have won the first prize then you will get a lump sum amount of seven lac and fifty thousand Rupees (Rs. 7, 50,000) that is a big amount for a salary person to get it to start a good business. Find you Pifra salary slip registration for govt employees. If you have such money that you may have already designed some ideas in your mind to build and grow your business. So I pray for you and my own to win this for this draw of prize bond 200 at Karachi on June 15, 2017. The second prize worth 250000 (Two lac and Fifty Thousand) have the 5 number of Prizes that increases the most up ratio to win. You can download 200 prize bond list for all year. This is also a good amount and this third prize amount is 12500 that will be awarded to 2394 numbers. All winning prize have their own happiness to win the game. This prize bond 200 draw list result on 15th June 2017 held at Karachi city will change the life of some poor’s and may increase the assets of the average businessman.